There is nothing better than fried garlic to kick things up a notch. This is heaven on earth for garlic lovers. If you’re a garlic lover, you’re probably an old pro at frying them up. They are a great topping for just about anything savory. When I’m in a garlic peeling and chopping mood, I usually chop up extra to fry up and use as a topping. There’s really no recipe for this, all you have to do is peel and chop up some garlic, heat up a bit of oil and fry them up until they are lightly browned and crispy. Drain them on paper towels to get rid of excess oils then use them to sprinkle on everything from salads to soups. I particularly like sprinkling fried garlic on Arroz Caldo or as my daughter calls it, chicken soup with rice. If you really love garlic, you can make a big batch of fried garlic and you can store them in a tightly sealed (airtight) container in the refrigerator for at least a couple of weeks. Just take some out as you need them and they will be crunchy and good as the day you made it. While searching online, I found this method for Fried Garlic in the Microwave, but it sounds a little scary to me. Oil and the microwave just scares me but if you want to give it a try, let me know how it worked for you. 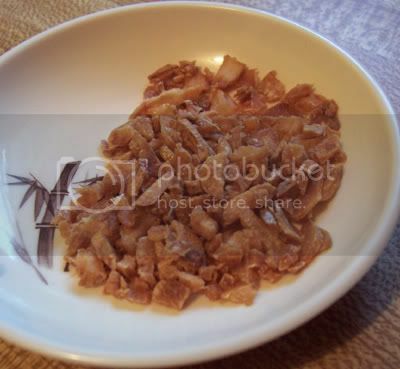 You can also buy Fried Garlic in a Jar from most Asian market. I can’t vouch for how they taste though as I’ve always made my own. I haven’t tried frying garlic before. My aunt gave us a bagful of garlic so maybe frying some up is in order. Now, peeling. . .so many cloves to peel. . .
You can purchase peeled garlic at Costco in the produce section comes in 3 or 4 lb bag.